Hori’s Onyx, available now in Europe, if the first officially-licensed third-party wireless controller for the PlayStation 4. It’s got its good points, like the Xbox-style staggered analog stick layout and one piece d-pad, but the lack of a headphone jack and other key DualShock 4 features might be a dealbreaker. I’ve been playing with the Onyx for the better part of a week, swapping between it and my normal Sony-branded (though vigorously modded) DualShock 4. I’ve almost gotten used to playing games like Destiny 2 with a controller with an Xbox layout, but I still find myself reaching for the face buttons when I need to move the in-game camera about now and then. Along those same likes, the placement of the “Options” and “Share” buttons takes some getting used to, especially the former, positioned quite close to the right analog stick. 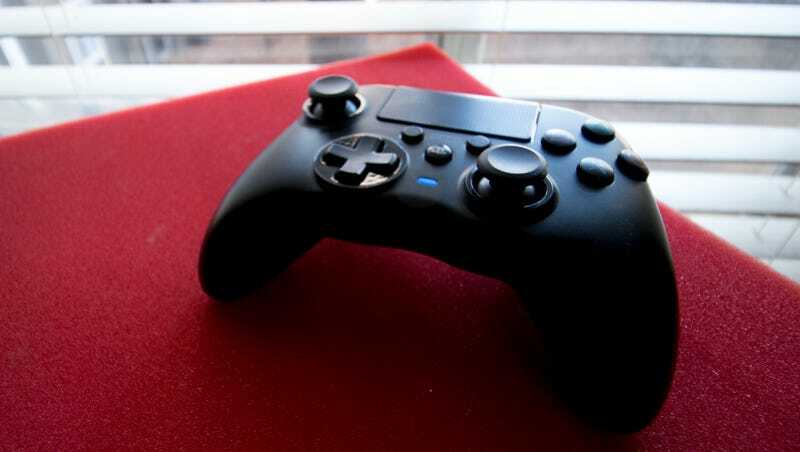 The Onyx feels good in my hands. It’s significantly lighter than the Xbox One controller and DualShock 4, but not so light as to feel toy-ish. The plastic of the grips is textured, the triggers feel good and the buttons give an excellent tactile click when pressed. The Onyx does feature rumble (at first I worried, since it’s so light), enough to get the job done. There is no headphone jack. For single-player games this isn’t a problem, but I’ve been doing quite a bit online lately, and not being able to plug in any old headset I have laying around is frustrating. A bluetooth headset solves the issue, but a bluetooth headset is also much easier to lose. I’ve lost my bluetooth headset. The other omissions might not seem as huge. There is no light bar, just a glowing button on the face that seems to change color when the bar normally would. There also is no built-in speaker, which more games like to use than I initially thought. Several times over the past week I’ve swapped out the dead Hori with a charged PS4 controller (the battery life seems comparable) and been surprised to hear sound coming from it. If you need a headphone jack on your controller, than obviously Hori’s Onyx isn’t for you. And really, if you live in the U.S. the only way to get one is to import it from Europe, and for those prices you might as well just buy another DualShock 4. But if you’re keen on that Xbox layout and need to be wire-free, right now the Onyx is your best and only choice.